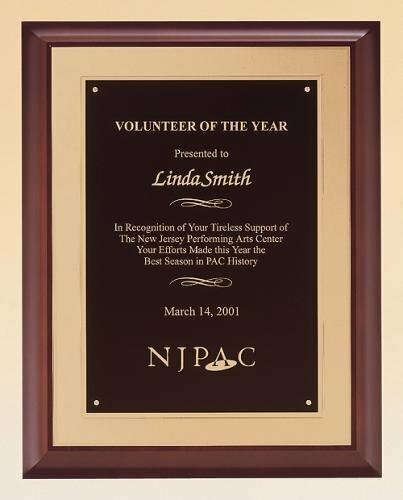 Black stained piano finish wood plaque with a cast metal antique silver finished frame and black aluminum engraving plate. 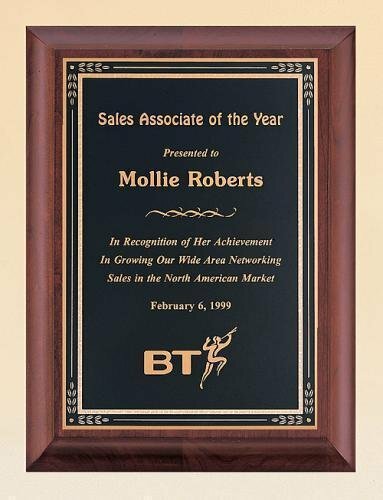 Over six layers of lacquer were hand applied and polished to create the glossy finish on this plaque. Individually boxed. Hand rubbed Cherry finished wood plaque with a ruby red marbled plate. Individually boxed. Hand rubbed Cherry finished wood plaque. With laser engraved black metal plate on a gold embossed back plate. Individually boxed. Hand rubbed cherry-finish wood plaque with a black and gold florentine metal plate. Individually boxed. 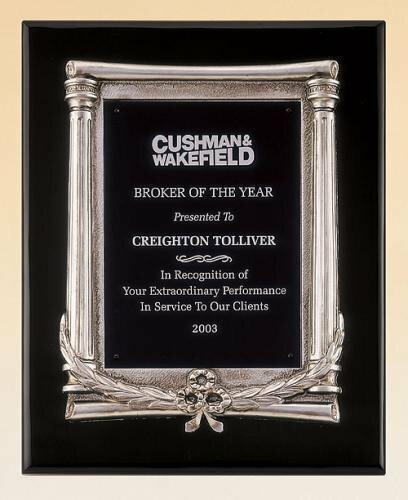 Hand rubbed cherry-finish wood plaque with cast metal antique bronze finished frame on brushed metal gold background. Laser engraved metal plate. Individually boxed. Plaque with walnut piano-finished wood and gold aluminum star. 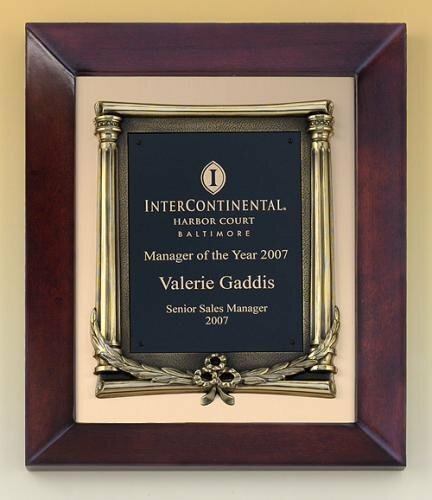 Over six layers of lacquer were hand applied and polished to create the glossy finish on this plaque. Laser engraved black metal plate. Individually boxed. Rosewood piano finish plaque with antique bronze finish finely detailed eagle casting. The same production techniques used to give expensive grand pianos their glossy look is available as a recognition award. 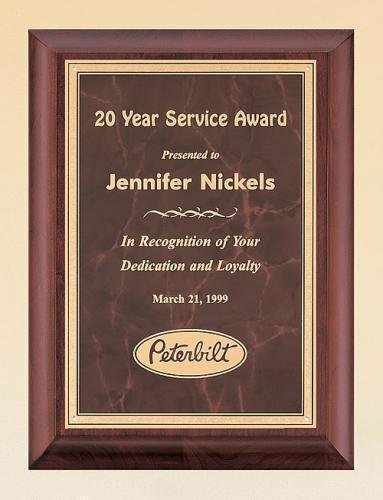 Over six layers of lacquer are hand applied and polished to create this plaque. Laser engraved plate. Individually boxed. 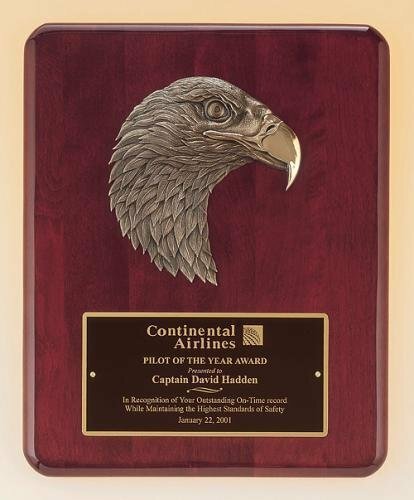 This Eagle Award recognizes their excellence. 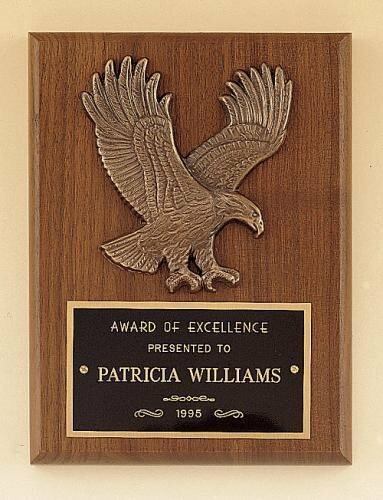 Solid American walnut plaque, with an antique bronze finish cast metal eagle. Laser engraved plate. Individually boxed. 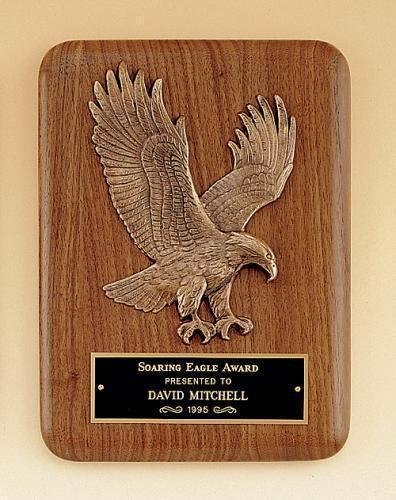 Solid American walnut plaque with an antique bronze finish cast metal eagle. Laser engraved metal plate. Individually boxed. 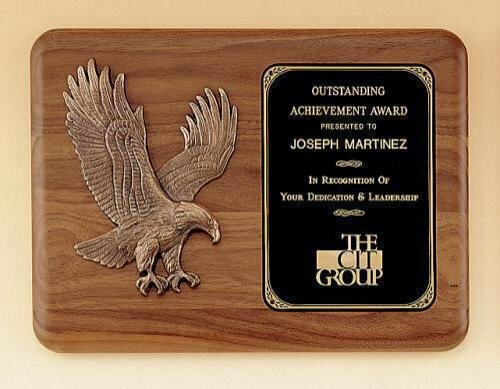 Recognize excellence with this quality Eagle Award. Solid American walnut plaque and antique finished cast metal eagle. Laser engraved plate. Individually boxed.